A while back I took a look at the first round of the 2002 draft and reviewed the picks of each team. With 10 years in the bank, it is fair to look back and judge how everything went for the teams. I would also like to review each team and will do so by division starting with the west. Here are the nine west teams and their 2002 performance. A look at the 2002 drafts of the West division teams by the numbers. Comments: They got a first round pick contributed nearly 700 league average innings before (with prospects) turning into Dan Haren. Additionally, they got a late-round gem in Kendrick who has developed into one of the better second basemen in the league save his currently monstrosity of a season (84 OPS+ in 215 PA). Plus there is the faintest outside hope that Jepsen and Wilson could still offer some plus value as they remain on the Angels roster. Delabar is currently with the Mariners. Comments: They had seven picks in the top 39 and two other top 100 picks yet returned just 23.6 WAR on those picks. I realize baseball prospecting is difficult, but for a team that was supposed to be on the cutting edge of scouting and analysis, that is not good. There were five others guys in rounds two through four who netted 20+ WAR and they had so many cracks at those guys. I would’ve given them a D, but Swisher netted Gio Gonzalez, Ryan Sweeney and Fautino de los Santos (who is still with them). Gonzalez turned into a host of talent this past offseason while Sweeney was part of the deal that brought Josh Reddick and minor leaguers Miles Head and Raul Alcantara. The former has a 1.074 OPS in High-A. So ostensibly they are still adding to the WAR total delivered from this draft even with Swish and Blanton (and even Gio) long gone. Comments: They got 166 plate appearances out of the 2002 draft. That’s it. LaHair gave them 150 (w/a .661 OPS) while some guy name T.J. Bohn (30th round) gave them another 16 of .607 OPS. Their first five picks were all high schoolers before they took a JuCo guys, followed by a Cuban and then two more high schoolers and another JuCo guy. They didn’t take a four year collegian until the 11th round. Not sure what that means, just pointing it. This was a bad, bad draft. Comments: Holy hell. I originally gave the Mariners an F- until I saw the Rangers draft. This is what happens when you don’t pick in rounds two through five. That’s because they signed Chan Ho Park, Juan Gonzalez, Todd Van Poppel and Jay Powell. Those guys delivered a whopping 0.6 WAR to the Rangers. That was the re-signing of JuanGone as he of course delivered 27.5 WAR from 1989 to 1999. Why did they wait three more years to hire Jon Daniels as their GM? The 2003 draft delivered John Danks, Ian Kinsler and Scott Feldman, but 2004 was another shitshow. Comments: One pick after the sixth round (Nippert) made the majors for this draft. Santos, originally drafted as a shortstop, was traded with Troy Glaus to Toronto for Orlando Hudson and Miguel Batista which netted the D’Backs 11.6 WAR going forward. That saved them from a D grade. The Blue Jays have clearly coveted Santos for some time as they traded for him twice. Comments: Strong 1st round pick and some decent fringe players that were basically league average (Spilborghs and Baker) for about 1100 games. Baker turned into Al Alburquerque which would have been a coup as he was great in his pro debut, but it was with the Tigers. Garza was a 40th round gamble out of high school, but stuck with his commitment to Fresno State and became a 1st round pick for Minnesota three years later. Comments: Solid 1st rounder in Loney, plus another hit in the 2nd round with Broxton and then their best pick 15 rounds later. Not to mention the fact that McDonald and Stults were picked in the 11th and 15th rounds and they are still contributing in the majors, although not with the Dodgers. They should’ve been more patient with McDonald, but they still get credit for the pick. While not a draft or prospect maven, I feel like four impact players and another contributor in Stults is an excellent return. Comments: After Greene, the 2nd through 11th rounders didn’t even make the majors and when you consider that McAnulty (12th) and Pendelton (13th) have been negative contributors as major leaguers, there was no positive value from the 2nd round until Kottaras in the 20th round. LaRoche was taken in the 21st round, but stuck around at his JuCo for another year and ended up going in the 39th round of the 2003 draft to the Dodgers. Comments: When you get a star, the draft is a success. And it’s a resounding success when you supplement that star with a handful of contributors as the Giants did here. All of their top four picks (Cain, Lewis, Ortmeier, Correia) made the majors. Most of Hensley’s positive value came elsewhere, but now, at age 32, he’s dealing out of the Giants’ bullpen with a sub-2.00 ERA. Sharp draft here for the Giants. I have been an avid watcher of the Futures Game for several years now. In fact, I can only vaguely remember the time when I didn’t care about prospects. I probably knew of the very best, say the 3-4 high impact prospects on the verge, but I certainly didn’t have decent or better knowledge of 80% of the Futures rosters as I do these days. This year’s game is sure to display some incredible talent likely to be making waves in the big leagues very soon, especially the United States roster. I don’t know if it is the best US roster in Futures Game history, but it wouldn’t surprise me if it was and it is definitely a contender. The pitching staff is just filthy with only Jameson Taillon toting a sub-9.0 K/9 and his 8.1 K/9 is hardly poor. Plus his 1.17 WHIP is one of the best on the squad. The staff has 704 innings with a 9.7 K/9 and 3.2 K/BB. Along with Taillon, they will roll out stud arms Taijuan Walker, Trevor Bauer, Dylan Bundy and Gerrit Cole among others. Three of those four were drafted just last year. Just an absurd amount of talent. The World roster is hardly bereft of talent with Jose Fernandez and Chris Reed standing out on their staff, both of whom were also drafted in last year’s insane first round. On the hitting side, viewers will be treated to Billy Hamilton, the blazing fast infielder in the Cincinnati Reds organization (who plays for the Bakersfield Blaze… pun wasn’t originally intended, but then when I noticed it I kept it on purpose so it became intended). Hamilton stole 103 bases in 135 games last year. With 80 in 66 games, he is on pace to steal 163 bases if he plays that many games again. That’s reminiscent of the first Billy Hamilton. Additionally, the US is trotting out Nick Castellanos from the Tigers organization who put together a ridiculous .405/.461/.553 line in 55 games at High-A before getting promoted to AA earlier this month. He had three 0-fers in High-A. Three. He also had 27 multi-hit games including a stretch of five in a row. He has come back to earth a bit in AA having already posted four 0-fers in his 11 games. Other names to focus on include Nolan Arenado, Travis d’Arnaud, Kolten Wong, Wil Myers, Christian Yelich, Mike Olt and Manny Machado. Those are just some of my favorite names, they all merit watching. Jurickson Profar is the standout hitter on the World roster (well, standout among standouts). The 19-year old shortstop for Texas is battering AA to the tune of .295/.374/.481 with 30 extra-base hits (out of 79 total hits) and an advanced approach especially when you consider his age. After posting 65 walks against just 63 strikeouts at High-A last year, he has remained strong with a 35/45 ratio. He is a special glove in the middle of the infield, too, giving the Rangers an embarrassment of riches that will likely result in Ian Kinsler moving once Profar is ready. The Cardinals haven’t missed a beat in their lineup this year despite the departure of Albert Pujols, but the core of Matt Holliday, Carlos Beltran and Lance Berkman is hardly young so they have to be thrilled to have 20-year old Oscar Tavares tearing apart AA after a superb season in High-A last year. I got a chance to see Tavares in the Arizona Fall League last November and only Arenado impressed me more among the players I saw. He has an aggressive approach, but it’s controlled aggression. While he doesn’t walk a ton (8% BB rate), he doesn’t flail wildly, either (13% K rate). He has a .323/.380/.579 line with 86 hits, 38 which are extra-base hits including 13 bombs. Keep a close eye on him when he bats. Additionally, I am really excited to see Francisco Lindor (Cleveland) as I haven’t seen him at all yet. I desperately hope he goes to AFL this November so I can get in a few games of his as I’m really excited about him going forward except for the fact that he plays for one of the rivals of my Tigers. Going back a few years, 35 of the 55 (five were injury or MLB promotion replacements) players on the 2010 rosters have reached the big leagues. 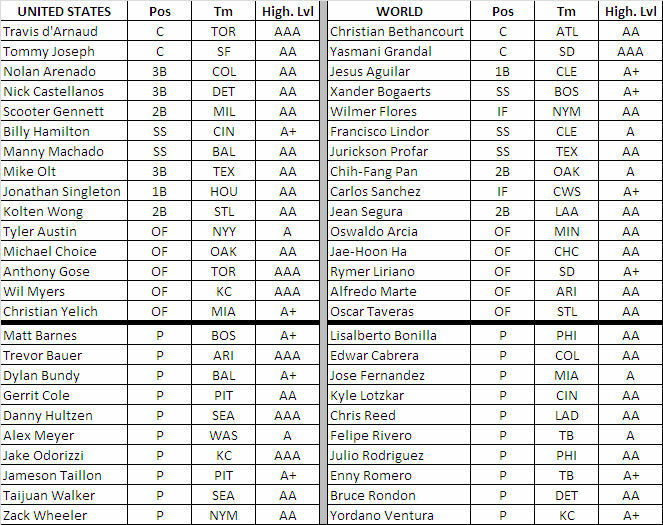 Looking even deeper, a full 80% (40 of 50) of the 2008 rosters have reached the majors. Meanwhile, Profar, Arenado, Machado and Myers are headed to their second Futures Game after making the 2011 game as well. This year’s Futures Game is on Sunday, July 8th at 4 PM Central on ESPN2 and MLB.tv. Despite a modest start to his AAA career (.250/.333./375), Bryce Harper is headed to Los Angeles to make his MLB debut against the Dodgers and Chad Billingsley. Harper made a push to break camp with the big league club, but that was always a longshot. Most saw his callup coming in mid-May or early-June, but the disabling of Ryan Zimmerman has facilitated the potentially high impact move for the NL’s best ballclub by record (14-5, .737 win pct.) and second to the 15-4 Texas Rangers for baseball’s best record. The 2-time #1 overall prospect according to Baseball America hasn’t been great in his 57 games in the high minors (37 in AA last year) toting a .254/.328/.388 line in 229 plate appearances with four home runs, but that won’t keep expectations from being unrealistic and sky-high. The potential is enough to make him worthy of a pickup in literally any format, but be careful with who you cut to get him in 10-team mixed leagues. Chances are strong that you have a replacement level player somewhere on the roster, but don’t drop a real talent just in hopes of catching lightning in a bottle. I really hope we see Harper coming up and catch fire immediately, but at the same time, that is unlikely. He will likely have his moments, but I think we will see a .240 average with 12-15 home runs if he stays up for the rest of the year. He is still just 19-years old. In the expansion era (since 1961), we have seen just 19 players come up and have 100 or more plate appearances as 19-year olds and the results have been mixed. Just six of the 19 ended up with an OPS+ of 100 or better (100 being league average). One of those was Ken Griffey Jr. who skipped AAA destroying the minors for 129 games before hitting the ground running on his Hall of Fame career. He was thought of as a once in a generation talent like Harper, who has… yep… 129 games of minor league work on his ledger. That is a decent collection of talent, though only Griffey was transcendent and Conigliaro may have been had it not been for his hit by pitch accident. How about the collection of those who were subpar as 19-year olds? Now that is a collection of talent. A-Rod, both Uptons, Yount, Beltre, Pudge and Jones all went on to have very successful careers (several of which are still going) including some Hall of Fame resumes in there. Meanwhile, Trout is running neck and neck with Harper for the top spot on prospect lists and he was pretty bland in his 40 games of work as a major leaguer last year. 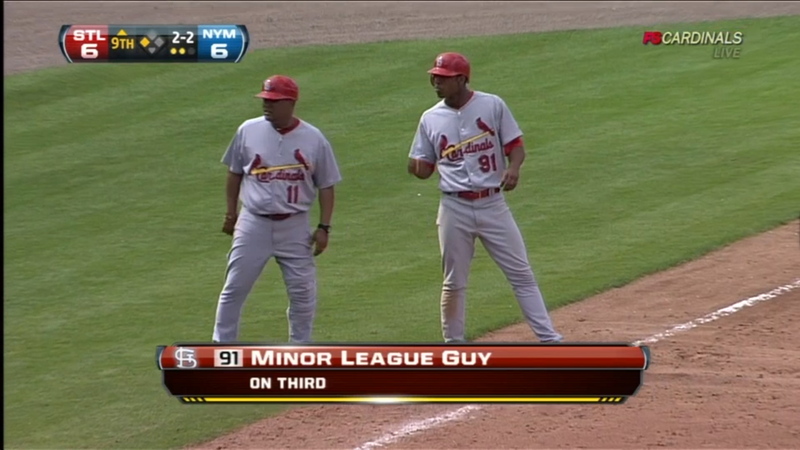 That was after a lot more minor league experience than Harper has had, too. The point is that you should temper your expectations with a 19-year old in the majors, especially one with limited AAA experience during which he has been pretty ordinary. There is a non-zero chance that Harper could set the world on fire from the jump. There is a stronger chance that he looks downright mortal and often overmatched as he gets acclimated to a level of competition unlike anything he has ever faced. He’s here!!! Today the Los Angeles Angels announced that Mike Trout will be called up to replace the injured Peter Bourjos. The stay could be temporary for the 19-year old from AA, but they will definitely give him some at-bats right away to see how their uber-prospect handles the jump. Trout tore through the Midwest and Cal Leagues last year as an 18-year old, skyrocketing up prospect boards in the process. His season of .341/.428/.490 with 28 doubles, nine triples, 10 home runs and 58 stolen bases landed him first or second on every board this preseason. Only Bryce Harper surpassed him on some boards. That is the intro to my write-up on Trout over at RotoHardball.com and you can click here for the rest. Instead of parroting my thoughts verbatim, you might as well just head over there to read my take as well as catch up on all the other great content we have at the site. The one thing I will add that didn’t format well over at RH was a chart of the 19-year old hitters who have come up in the last 20 years. This might give you an idea of what to expect from Trout. As amazing of a prospect as he is, don’t be surprised if he doesn’t fare well right away, especially after skipping AAA. Look at the names on that list, except for Karim Garcia they are all star players and only Edgar Renteria did well. BJ Upton wasn’t awful, especially considering how much his fantasy managers would love a .258 average these days. Temper your expectations on the shiny new toy. Perhaps the best bet if you do get him is to flip him. If you’re in contention and you have him in a keeper league, you can fetch an absolute mint for him and severely improve your title hopes. Re-draft league returns won’t be as significant, but you can cash in the ticket for an improvement to your team. Sure it might pan out for that team, but you might also get something for a guy who could be back in AA or AAA by the time the All-Star break is over. EDIT: It appears on Baseball-Reference.com has Renteria as debuting at age 19. They have his birth year as 1976 while every other outlet I have seen has him at 1975. Of course this only strengthens the point about 19 year olds struggling. When you lop of his debut, the remaining six have a .228/.281/.390 line in 825 plate appearances. Thanks to Paul Bourdett for pointing out the inconsistency of BRef & other outlets to me on Twitter. As I have become more and more interested in prospects the last few years, the All-Star Futures Game has become one of my favorite events of the year. This year’s sets up to be another great game with the best & brightest of the game’s future getting a chance to show off on a big stage. This year’s game is highlighted by the consensus 1-2 prospects in the game this preseason: Mike Trout and Bryce Harper. The order of the two may have varied, but they topped just about every list. Bryce Harper WAS 18 A+ 1 .330/.429/.586, 14 HR, 45 RBI, 13 SB in 227 AB Living up the immense hype in pro debut, what will he do next?